High Altitude Platform (HAP): Broadband For All? Broadband is taking off everywhere, speeds are increasing and everybody’s happy. Well almost. Broadband isn’t available to all, especially those in more rural areas. Unfortunately cable companies don’t have the financial resources to lay fibre everywhere (especially in today’s economic climate) and even BT, who are radically changing the old telephone network so that every exchange in the UK is wired up for Internet, still won’t be able to reach rural customers. It isn’t because they don’t want to, but (in BT’s case) the DSL (digital subscriber line) technology just doesn’t work at long distances. This will leave large percentages of the population without broadband and currently their only option will be expensive satellite systems. There’s a chance that some kind of fixed wireless access (FWA) solution will become available, but currently the technology is expensive and again requires a massive investment in radio masts and connecting them all together. Unfortunately FWA is likely to be used for backhaul in more urban areas where the population density justifies the upfront investment. Luckily it looks like there is an answer, and it’s call HAP (High Altitude Platform). There have already been trials of HAP using tethered balloons, and these have been reasonably successful, but there are problems. They are relatively low altitude, so may interfere with other air traffic. However being tethered means they can use the tether cable to connect to the infrastructure on the ground (i.e. say the Internet), but it limits them to being tethered in suitably connected areas. Utilising a real HAP solution means sending what could be called airships up 20Km or so, these would freely roam the sky. Being so high they wouldn’t interfere with commercial air traffic – of course would still need to get approval from the international aviation authorities, especially for launching them and what happens when something goes wrong or they falls back to earth. Other approaches to HAP involve lightweight aircraft, such as the European-funded Capanina project. Both balloon and fixed-wing platforms would use radio systems (similar to satellite) to transmit to end-users, who would use a steer able dish that tracks the HAP. Current thoughts are that the HAPs will use both radio and optical transmissions between HAPs (since optical interference is very low at 20Km altitude). 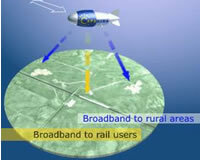 The HAP end-user connection may use existing WiFi-type solutions to actually connect people, so a small village may have a central HAP system which then people connect to using traditional systems. Where HAP can offer significant benefits, is to moving objects such as trains. They would use a sophisticated electronically steer able aerial to track the HAPs and would allow continuous reception of signals – even between HAPs. Since the bandwidth between a ground receiver and the HAP would be about 120Mb/s, rural (and moving) users might actually get a better service than traditional broadband users. Unfortunately it’s going to take a while for this to be a commercial reality, but at least people are thinking about it, trials are commencing now and it’s got European funding.